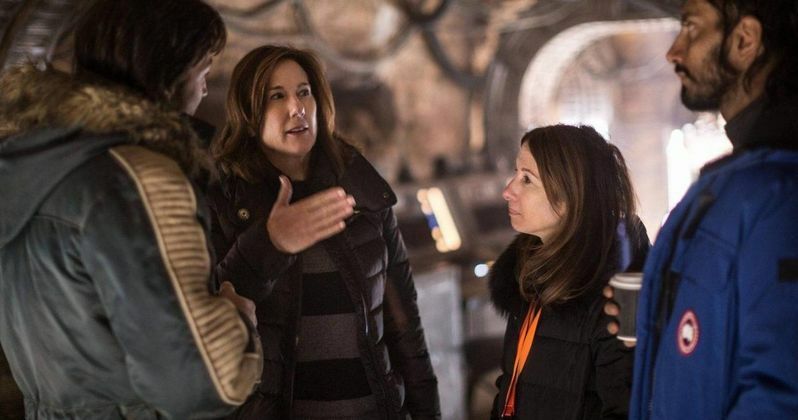 Disney Wants to Dump Star Wars Boss Kathleen Kennedy, But There's a Problem? After an incredibly disappointing box office performance with Solo: A Star Wars Story, rumors started to swirl that Disney was looking to replace Kathleen Kennedy as the head of LucasFilm, overseeing the Star Wars franchise. There were more specific rumors that Marvel Studios president Kevin Feige would be brought in to oversee the Star Wars franchise, but that was shut down earlier this month. Now a new rumor claims Disney wants Kennedy out, but they're having trouble finding a replacement. Here's what Beyond the Trailer's Grace Randolph had to say in a new video, adding that her source came "deep within Pinewood Studios." "There was a call, a secret conference call with all the top Star Wars brass in attendance, the kind of call where, apparently, security guards stand outside the different conference room doors and makes sure that no one eavesdrops. But here's the kicker. Top brass at not only Star Wars, but also Marvel and Pixar, were also in on the call, but listening only, likely at the request of Bob Iger, who wants their advice on how to fix this s--tshow. And yes, he does know it's a s--tshow. Evidence? The word that he wants Kathleen Kennedy out. He actually does, but, nobody will take her job. Several have been approached, but turned down, including J.J. Abrams, who turned it down flat and didn't even hesitate." While this may support the ongoing rumors that Kathleen Kennedy's days atop LucasFilm are numbered, none of the following details have been confirmed, and they likely won't be by anyone at Disney and/or LucasFilm. Still, given all of the controversy swirling around Solo: A Star Wars Story, plus the franchise-low box office numbers, most expected some sort of changes to be made, but getting rid of Kathleen Kennedy after one flop (Solo: A Star Wars Story), and three massive hits (Star Wars: The Force Awakens, Rogue One: A Star Wars Story and Star Wars: The Last Jedi), seems like too drastic a step, for some. Here's what Grace Randolph had to say about why Disney was having so much trouble finding someone to take over this beloved franchise. "Why does nobody wanna run Star Wars? Well, it's probably pretty obvious for many of you, but let me spell it out for you. And that's in risk-averse Hollywood, nobody wants to run a house divided, which apparently is what Kathleen Kennedy has created. It's divided between her loyalists, which she brought in and wear those "Force is Female" t-shirts, and the loyalists to the brand itself that were there before Kathleen." Randolph then goes on to suggest that Dave Filoni, who has run both the hit animated shows Star Wars: The Clone Wars and Star Wars Rebels, would be a great fit to run LucasFilm, but apparently the Disney brass doesn't think he's right for the job. Randolph also adds that she thinks it's a "sad commentary" on the Hollywood climate itself that they can't find anyone to come in and "right the ship" by making the tough decisions like not only firing Kathleen Kennedy, but all of her "loyalists" at LucasFilm. You can take a look at Grace Randolph's full video below, courtesy of Beyond the Trailer YouTube.